This entry was posted in Aluminum Deck Railing, aluminum fencing, Aluminum Gates, Driveway Gates, metal fences, pool safety and tagged aluminum fences for pools, aluminum fencing panels, aluminum gate, aluminum gates, aluminum pool fencing, aluminum pool gate & fence, aluminum pool gates, aluminum swimming pool fences, metal pool fence, Pool Fence, pool fencing, swimming pool fencing on April 5, 2018 by admin. Are you interested in installing an aluminum fence in your yard or around your in-ground swimming pool? Before you design, order or install your new fence it is important to understand the benefits and advantages to the material you are selecting. The goal when installing a new fence is to choose a material and style of fencing that works well with the look of your home. It is also important that the fence meets your expectation in regards to ease of installation and maintenance as well. When looking into different materials for your fence you will see that aluminum fencing is the only way to go. The benefits derived from aluminum fencing over other materials are abundant. Below you will find the top five reasons consumers give when selecting aluminum fencing for their swimming pools or the perimeter of their landscape. Visual Appeal: Aluminum is the most aesthetically pleasing material that can be chosen for fencing. It is that may have available in a number of styles and color combinations; one is sure to accentuate your home and landscape perfectly. The appeal of aluminum extends to an increase in property value for your home as well. Maintenance Level: One of the most beloved characteristics of aluminum fence is the care level at which it takes to maintain the fence. Aluminum is basically maintenance free. It does not require painting, staining or yearly power washing. In order to allow aluminum to look as beautiful as the day it was installed spray it yearly with a garden hose and be sure to remove any algae or moss. An aluminum fence is the most sturdy and durable type of fencing available. It will stand the test of time wearing better than any other fencing material on the market today. Safe and Secure: Aluminum fence panels can be purchased in a variety of heights. This will ensure that your homes perimeter will not only keep your kids and pets safe within; it also ensures that others stay out. This is true for aluminum pool fencing that is installed around an in-ground swimming pool. The fence height can be ordered to meet B.O.C.A. regulations. This will help to keep little ones out of the area while not in the presence of an adult. Colors, Style and Sizes: Variety is something that aluminum fencing is never short on. There are several styles, colors and ornamental decorations to choose from when looking into a fence for your yard. Aluminum fence panels are truly customizable to your particular need. No other fence material has as many variations as aluminum does. Ease of Installation: Aluminum fence is one material that can be installed on your own and look as if it was done by professional fence installers. The process of installing an aluminum fence is fairly simple. Following the step by step instructions and using online support, installing your new perimeter fence can be simply done within a weekend. When you look into other fence materials you will see how aluminum outweighs the competition in every way. Aluminum fence offers a large variety of choices is visually beautiful, maintenance free, secure and can be installed easily; what more could you ask for? This entry was posted in aluminum fencing, pool safety and tagged aluminum fence, aluminum pool fencing, aluminum swimming pool fence, B.O.C.A. Pool Fence Requirements, Pool Fence, pool fences, pool fencing, Pool Safety Fence, Swimming Pool Fence on April 8, 2015 by admin. Winter is the perfect time to plan for your aluminum fencing project. Winter preparations ensure that your aluminum fence panels, posts and hardware are available to be shipped when you are ready for installation in the Spring. 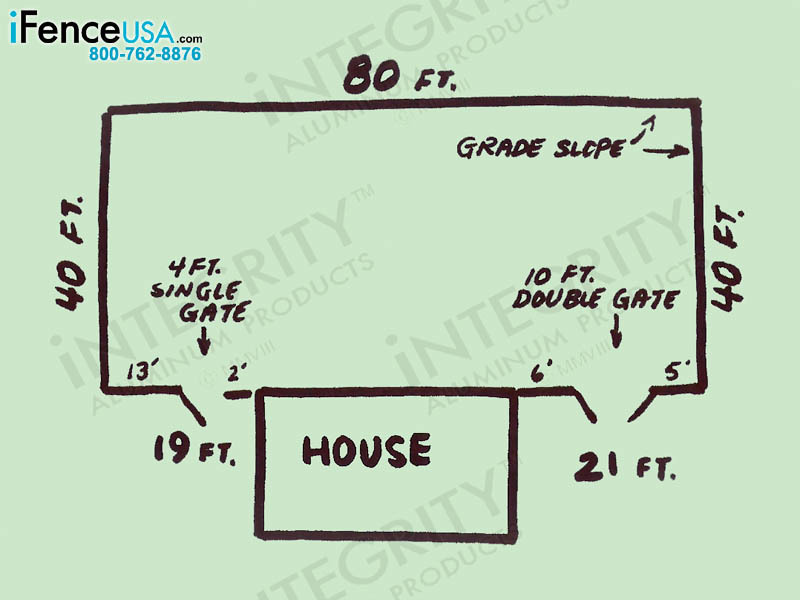 Start Planning With A Simple Sketch Today! This entry was posted in aluminum fencing, How-To Guide and tagged Pool Fence, pool fencing, Pool Safety Fence on January 7, 2015 by admin. When considering a new swimming pool, it is very important to plan ahead for a safety fence to protect children from the possibility of accidental drowning. For instance, swimming pools can be enclosed by a fence surrounding the pool while totally detached from your house or other “pass through” structure. Another plan is to use the house itself as a partial barrier, with fencing extending out from it to enclose the pool area and then terminating back at the house. The latter plan may comply with your local community pool safety codes (usually with alarms on all points of entry into the pool area from within the house), but it is our considered opinion that a separately enclosed pool area offers children a greater degree of protection. A child that “slips” outside would still have another layer to get through. We encourage you to thoughtfully plan for the safety of children, not only your own but also others who may visit, and make decisions based on what you think is best, and the governing laws in your community. These laws, or codes, often comply with what is known as the BOCA pool fence safety standard. Some communities offer more relaxed versions of this standard while others demand more stringent standards. Usually, you can find out what the laws in your community are by simply getting on line and searching the name of your county, township or city along with “pool code” or “building code.” If this doesn’t work, call the appropriate government office directly and ask for a copy of the code. Additionally, it is a very good idea to see if you have a neighborhood association and whether this association has additional binding requirements. 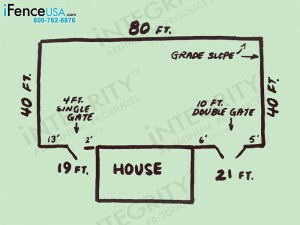 At iFenceUSA.com, we specialize in pool fence designs that comply with the BOCA code for pool safety. We can also modify fences, as needed, for more stringent requirements. Please visit our link on pool safety to learn more about the BOCA pool safety standard. You can also call us for compliance assistance. We are happy to review any document you provide us with, as well as supply you with architectural drawings that give detailed dimensions of our products. These can be very useful as governing authorities often require this information at the time permit(s) are pulled for your project. We cordially invite you to put our experience to work for you. No pressure, just good old-fashioned service. No kidding. This entry was posted in aluminum fencing, How-To Guide, pool safety and tagged BOCA pool saftey code, How-To Guide, pool fencing, pool permits, pool safety barriers, swimming pool safety fence on January 3, 2011 by admin.